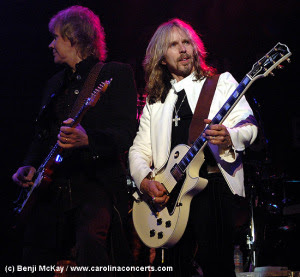 Pioneer ’80s rockers Styx recently (May 18) played the House of Blues in Myrtle Beach, SC. I went to the show basically with the state of mind: “what the hell, I don’t have anything better to do.” Needless to say I’m glad I went. With two intact founders, Tommy Shaw and James Young, Styx absolutely rocked. They were really at the top of their game playing classic standards such as “Come Sail Away,” “Lady ’95,” “Too Much Time on My Hands,” “Miss America,” and a great “pump up the crowd” opener “Blue Collar Man.” The show also included some licks from their new album of covers. Most notably, their rendition of “I am the Walrus” thoroughly impressed me. The show would have been good with the set list how it was and a less than enthusiastic crowd. The show was great because the members of Styx were having a great time, and the audience was very worthy singing nearly every song word for word. I am pretty sure Styx’s jubilation was not acting as this was the opening night of their Summer tour and they felt comfortable enough adding a song to the set list (“I Don’t Need No Doctor”). Although I had made a pact with my traveling companion to burn the place down if they didn’t play “Mr. Roboto,” it really wasn’t necessary in the structure of the show and probably would have segmented the flow too much. All in all this was one of the most solid performances I’ve ever seen, and I highly suggest catching a date on their second leg starting in July.